The expanded plan comes after the Texas Civil Rights Project threatened to sue the county on behalf of two Texas State students. In an emergency meeting, the Republican-dominated court voted to re-open the early voting site that operated on campus during the first three days of early voting. The polling location at the LBJ Student Center will reopen on Nov. 1 and Nov. 2 from 7 a.m. to 7 p.m. The commissioners also agreed to add an Election Day voting site at the university. "I want everyone to know and understand that we are doing our best. We are trying to follow the laws and allow the opportunity for all to be able to vote in the most efficient manner possible,” Commissioner Lon Shell, a Republican, said before the court went into executive session to discuss the issue. More than 1,000 people had reached out to the court over the early voting issue with some attempting to politicize it, Shell added before pointing out that the voting schedule this year was similar to 2016 — a presidential year — and had been reviewed in advance by both party chairs. The vote comes less than a day after lawyers with the Texas Civil Rights Project — on behalf of two Texas State students, MOVE Texas Action Fund and the League of Women Voters of Hays County — sent the county a letter alleging that the decision to limit early voting at the on-campus location was a violation of the U.S. Constitution because it specifically targets a class of voters. The Texas Civil Rights Project also claimed the closure of the on-campus polling site violated two portions of the Texas election code — one that limits the number of temporary polling places in a county commissioner’s precinct to maintain balance between precincts and another that regulates the number of polling locations that must be set up for a voting precinct. In laying out the recommended changes to the court, Mark Kennedy, the county’s general counsel, indicated that county was not in compliance with either of those requirements. "It has never been the intention of the county to suppress any vote," Commissioner Debbie Gonzales Ingalsbe, the sole Democrat on the court, said before the vote. The on-campus polling location has served as a temporary site — and not one that is open during the entirety of the two-week early voting period — since it was first established, according to the county’s election administrator. But students looking to cast their ballots at the LBJ Student Center on campus this week faced hour-and-a-half waits throughout the first three days of early voting. The county’s young voters who were unable to cast their ballots in that time frame would be disproportionately burdened by the closure of the voting site, especially because they are “more likely to live on or near campus and are less likely to have easy, immediate access to reliable transportation to vote off-campus,” Beth Stevens, the Texas Civil Rights Project's voting rights legal director, wrote to the county. 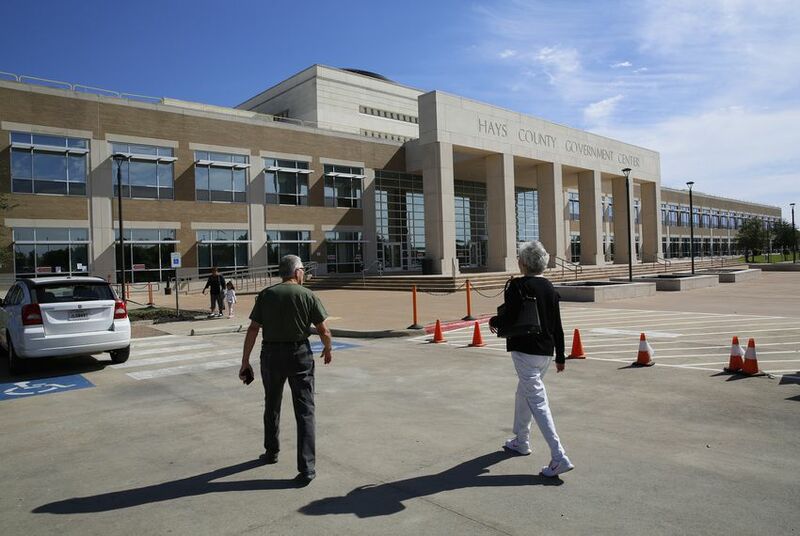 The Texas Civil Rights Project had originally given the county until 12 p.m. Friday to respond before it filed a lawsuit but held off in light of the meeting. This is the second time this week that Texas college students have successfully pushed for increased access to early voting. On Thursday, Waller County announced it would expand early voting in Prairie View, which is home to Prairie View A&M University. That decision came two days after students there sued the county over allegations that the county was suppressing the voting rights of black residents. Disclosure: Texas State University and Prairie View A&M University have been financial supporters of The Texas Tribune, a nonprofit, nonpartisan news organization that is funded in part by donations from members, foundations and corporate sponsors. Financial supporters play no role in the Tribune's journalism. Find a complete list of them here.